Chaotic skies this morning with a variety of cloud forms. Upper-level instability led to some buildups above 500 mb, and these were accompanied by virga and mammatus. 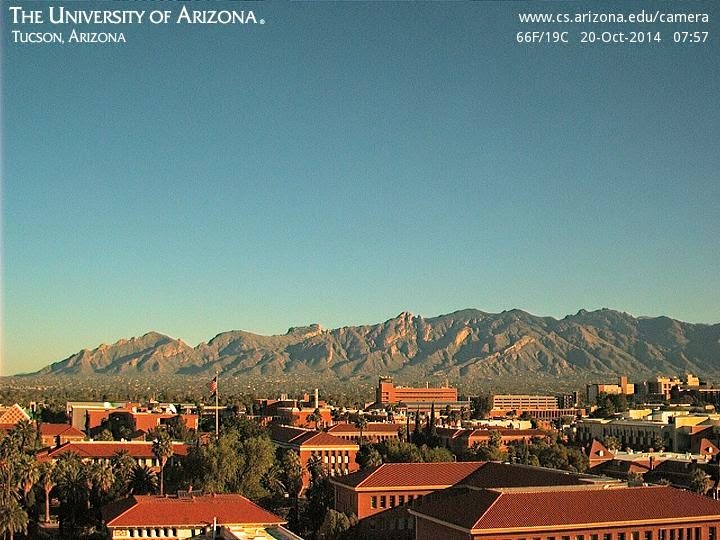 View of Catalinas above is from campus at 7:00 am MST. Strong cold front over the central U.S. this morning, with the far southwestern portion of high pressure pushing a backdoor front into southeast Arizona this morning. The main impact of this fast-hitting weather feature will be some gusty east to southeast winds later this morning. Then the trough moving in from the Pacific will dominate our weather for the next few days. The early WRF-NAM forecast from Atmo this morning, shown below, is for 10-m winds valid at 9:00 am this morning. The model forecasts showers and light precipitation with the cold front on Sunday, with rainfall amounts light except at highest elevations. The model forecasts some snow accumulations with the front on Mt. Graham and in the White Mountains. It appears that Monday night could be quite cold here in the north part of Tucson along the Rillito. If skies are clear with calm winds in this area, we will probably see our first morning with temperatures at or just below freezing - so quite a change on the way. Features noted yesterday have moved eastward and northeastward during past 24-hours. The upper-level trough that will move across the Southwest is currently at about 30 N 125 W - above is 1100 UTC water vapor image this morning. This feature has mostly some high-level cloudiness with it. Meanwhile, the NHC has begun forecasts for a new tropical depression (EP-21), that is currently south of southern Mexico.- IR image of 21-E below is from 1145 UTC this morning. 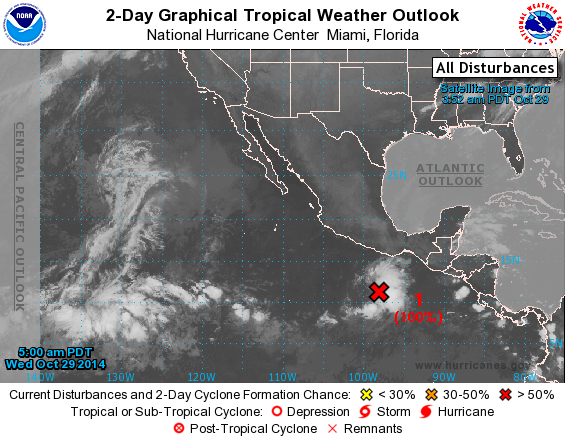 The first NHC forecast for this system is shown at the bottom. The depression is forecast to strengthen eventually to hurricane strength as it heads north toward 20 N west of Cabo Corrientes. The global models indicate that the northward advance will be blocked early next week and moisture associated with this system may primarily affect north-central Mexico and perhaps the Southern Plains. Edited to add: Forgot to mention that if this disturbance becomes a names TS/hurricane it will be "Vance". October has been very mild over much of the country this year. Here in the Southwest there has not been much to write about since the thunder, winds, and dust, with some light rain, back on October 19th. However, it appears that the first days of November will bring substantial changes to the western and eastern thirds of the country. A cold and intense coastal storm is being forecast by some of the models for the East and Northeast out around 96 to 120 hours. Out here in the West a substantial 500 mb wave will dig southward and eastward from the Gulf of Alaska - centered this morning at about 50 N and 150 W in the above 14 UTC water vapor image. A weak upper-level short wave at about 25 N and 130 W has a substantial plume of upper-level moisture to its south and east that extends down to about 5 N. As this feature moves northeastward ahead of the major feature approaching the Northwest, it may bring some high cloudiness to southern Arizona to close out October. Temperatures over the weekend will be much cooler than the expected low 90s of the next couple of days. The northern part of the major wave will shear away to the northeast and leave behind a weak trough or closed low at 500 mb over northwestern Mexico. Both the closed low and a developing tropical disturbance, see this morning's NHC Outlook below, could come into play for parts of the Southwest and even Southern Plains early next week. The tropical system will be a wild card in the forecasts for next week, as currently model predictions of this feature are all over the place. There were isolated showers yesterday afternoon over higher elevations of eastern Pima County. The plot above shows CG lightning flashes through midnight last night - very large decrease in activity when compared to the same plot for Sunday in yesterday's post. 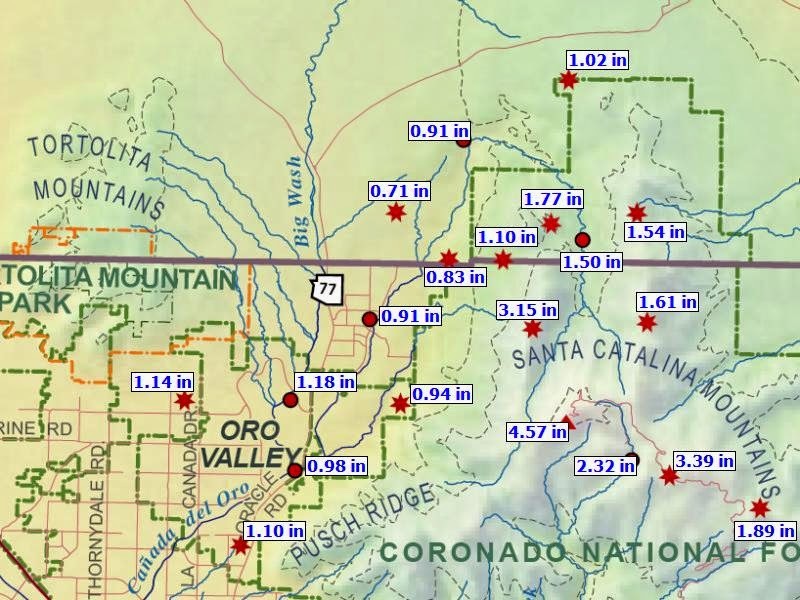 Rainfall was measured at 9 ALERT stations (10% coverage) and these sites were in the Catalinas/Redington Pass area and also at the far south edges of network. The early WRF-NAM forecast yesterday was quite good again. Today's model run forecasts only light showers at the very highest elevations of eastern Pima County. This morning was clear and crisp, as per view of Catalinas above, with temperatures this part of town in lower 50s around sunrise. Yesterday was an active thunderstorm day, especially for October, and the plot of CGs below is for 24-hours ending at 1 am MST this morning (Monday, October 20th). There were two severe storm reports locally - lines and poles down somewhere between Ft. Lowell and River and hail to size of golf balls near Tubac. I suspect that the lines were felled near here, because of power surges and blinking lights. Across the ALERT network areal coverage of rainfall was more than 70% for 24-hours ending at 5 am MST this morning. There were 19 sites with more than 1/4 inch and 5 with more than 1/2 inch. Keystone Peak, off in southwest part of network had 0.83 inches. Largest amount I noted this morning was 1.14 inches, with thunder and gusts to 52 mph, at Safford. Here at house we had thunder, wind, dust, gusts of 40 to 50 mph, but just 0.14 inches of rain. It was interesting that storms avoided the higher elevations of the nearby Sky Islands with little rainfall noted at spots like Mt. Lemmon, where POPs and amounts are usually much higher than at lower elevations. The early run of the WRF-NAM model was quite good for yesterday afternoon and it kept the rain at lower elevations here in the metro area. Its areal coverage also appeared fairly accurate. This morning's sounding at TWC on campus (skew-T plot above) is much stabilized, compared to yesterday's. There is at most a sliver of afternoon CAPE at low elevations and the early WRF-NAM reflects this, with its forecast of only some very isolated showers on the mountains today. 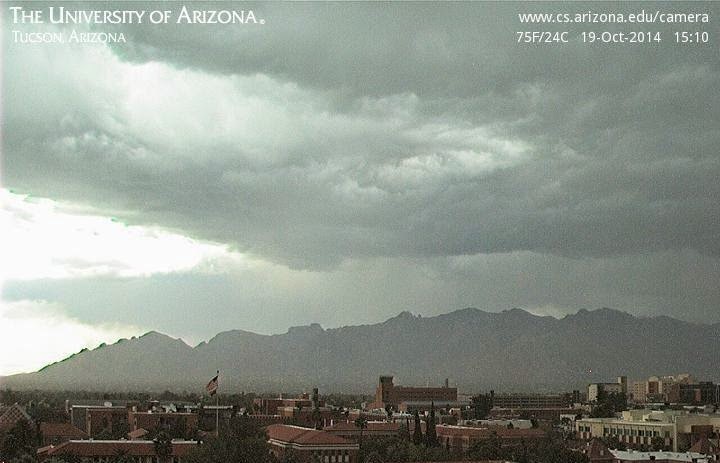 Showers and thunderstorm are moving across the Tucson area this afternoon and web cam view above shows high storm bases and light showers between the University and the western Catalinas. Here at the house we had strong outflows (estimated gusts 40 to 50 mph) about half an hour ago, with blowing dust and several power surges. Composite radar image from NWS TUS below at 2:36 pm shows a number of strong storm cores over southeast Arizona with reflectivities of 50 to 60 dBZ. Shown here are two products from the TUS radar that are available at the College of DuPage weather site. Thunderstorm tops (at 2:41 pm MST, above) are in the 26 to 32,000 ft msl range, with some higher tops indicated at long ranges (this may be a bit of an artifact due to beam width at those ranges). The 0.5 degree beam, dual-polarization hydrometeor type algorithm (below, also at 2:41 pm) indicates hail and graupel with the storms cores. Quite an interesting afternoon. Friday evening sunset - Katie took this photo with her phone as we were driving south on Highway 83. Ridge to west is the north end of the Santa Rita Mountains. Earlier in the afternoon showers over metro Tucson produced a couple of sprinkles and a Trace at the house. Unusual and somewhat strange situation today. A weak short-wave and closed low is centered out near the north end of the GoC this morning in lower levels. The circulation has a pronounced tilt toward the northeast with height and very warm upper-tropospheric air is within the upper part of the circulation. This results in a very strong inversion just above 400 mb. The above skew-T plot is the early WRF-NAM forecast for Tucson valid at 2 pm MST this afternoon. The inversion is weaker in the model forecast, as would be expected, but still provides a formidable cap to convection rooted at lower levels. The forecast sounding exhibits CAPE from just above 700 mb up to just above 400 mb. Note that the lifted parcel temperature excesses are actually quite large around 500 mb, indicating substantial vertical accelerations in any convection that develops. Any thunderstorms that occur would be fairly short and stubby towers, with bases around 11,000 feet and tops around 26,000 ft MSL. However, the updrafts should be potent enough to produce some lightning and perhaps small hail or graupel. The graphic below shows the early WRF-NAM forecast of composite radar echoes valid at 3 pm MST this afternoon. A weak, middle and upper-level short wave is moving into Arizona today from the Pacific. There are several bands of very light showers ahead of this feature. The graphic above is TUS NWS radar composite chart for 8:22 am MST this morning - showers are moving generally northward while the bands are inching eastward. Visible satellite image from 8 am below shows that most of Arizona has heavy cloud cover this morning. Perspective from the water vapor image, at same time above, indicates the upper-tropospheric vorticity center is probably near Yuma this morning. The 12 UTC TUS sounding plot below indicates that cloud bases are very high - near 500 mb (i.e., around 16,000 ft msl) with temperatures at cloud base being around -6 to -10 C. Today's short wave will be followed by another on Sunday and yet another Wednesday - so some cloudy periods and perhaps more light showers off and on for next five days or so. 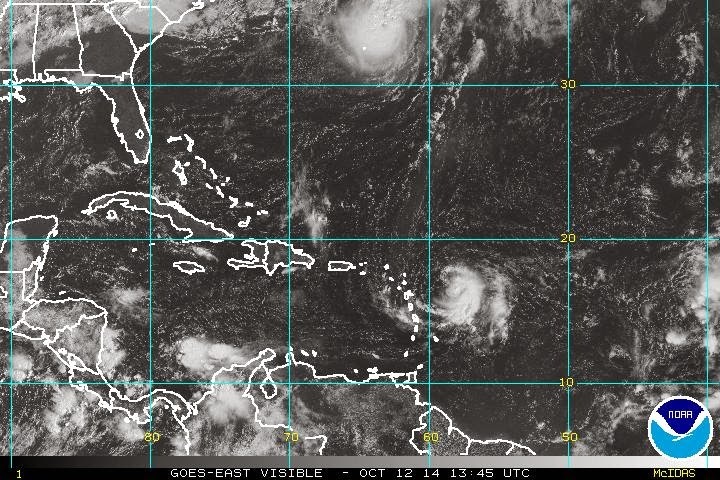 The NHC has upgraded Gonzalo first to a hurricane today and now to a Category 3 storm. Visible image above is from 2115 UTC this afternoon and shows Gonzalo well to the north of Puerto Rico. The wind speed probabilities plot below shows that the current track forecasts take Gonzalo near Bermuda, which is cleaning up after being struck by Fay. Looks ugly for the baseball playoff game this evening in Kansas City. Above is current NAM forecast of 6-hour rainfall ending at the start time of the game. 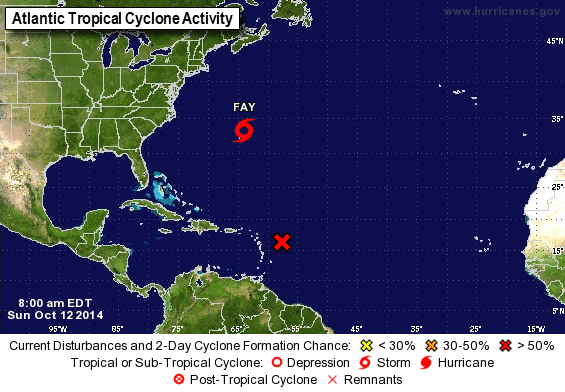 Tropical Storm Fay struck Bermuda overnight with some wind gusts over 80 mph. The storm is now expected to move rapidly east-northeastward. The NHC forecasts high chances of development of a depression or storm from a disturbance that is currently approaching the Windward Islands. Above is current NHC activity chart for the Atlantic and below is a visible satellite image from 1345 UTC this morning. Over the U. S. the coming week will feature unsettled weather over the central and eastern portions of the country, as well as the far Northwest. A 500 trough currently over the northern Rockis will will amplify as it moves southeastward across the Four Corners Region, developing into a major trough over the Southern Plains. This system closes off and moves slowly eastward during midweek, before imapcting the northeast. Shown here are the GFS ensemble 500 mb means and spaghetti plots. Above graphic is valid at 1200 UTC on 15 October and below is valid at 1200 UTC on 19 October. The GFS ensemble members display little spread in their forecasts (except high latitudes, through next weekend. The West will enjoy mostly mild and fairly typical Fall weather. 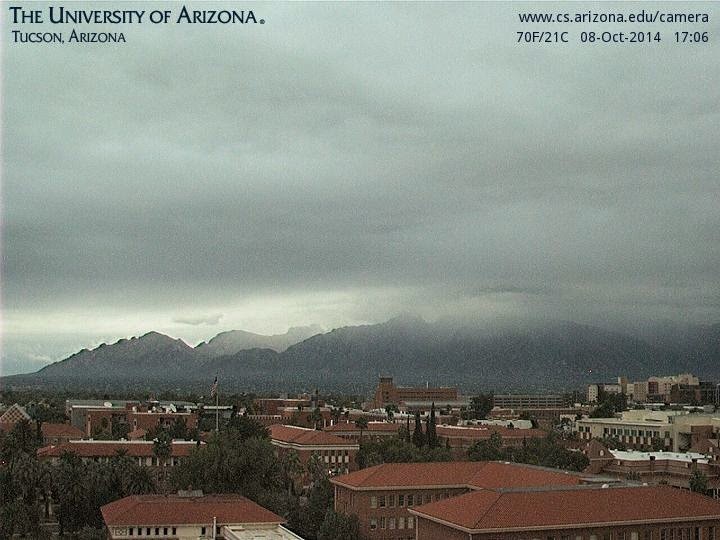 Residual low-level moisture will support some isolated mountain thunderstorms over eastern Arizona. Above is 12 UTC WRF-NAM forecast of radar echoes valid at 3 pm MST this afternoon. We were in Phoenix yesterday, and there were visually impressive thunderstorms, in the distant northeast to east, during the late afternoon and evening. The models forecast a repeat today as a weak, 500 mb, short wave moves across the state. Further drying is forecast after today, Below is the 06 UTC WRF-NAM forecast of PW valid at 10 pm next Monday night - significant PW is pushed far south to Sinaloa and lower latitudes, so several very nice days on tap here. The plot above shows that CG flashes were very limited for the 24-hours ending at 12 UTC. There were thunderstorms ongoing at sunrise up in the Rim Country and also a heavy storm was moving through the east side of the Phoenix metro area. This has turned out to be quite some rainfall event, particularly in the Catalinas, which have received the heaviest rains here in southeast Arizona during the past 24-hours. 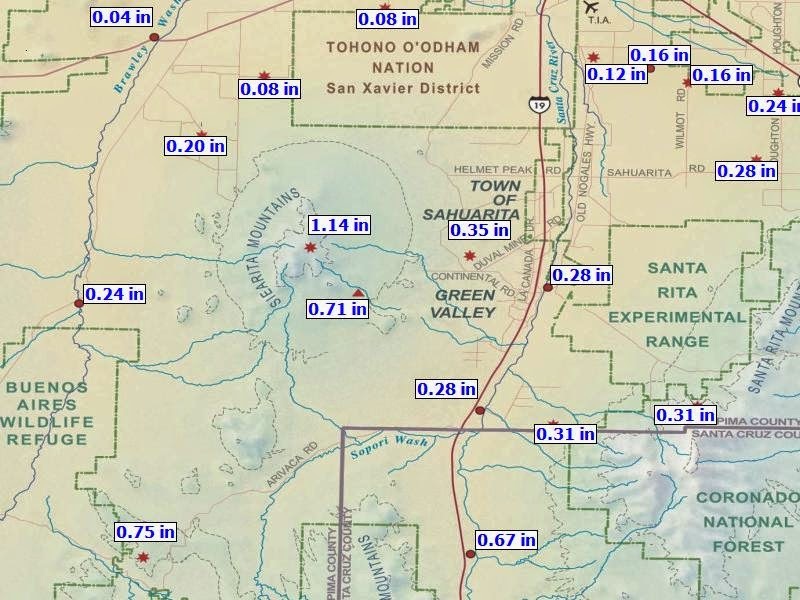 The plot below shows 24-hour rain amounts over the Catalinas sector of the ALERT network at about 5:30 am - note two stations reporting over 3 and 4 inches! Across the entire ALERT network there was 100% coverage and an amazing number of stations (45, or approximately 50% of the sites) reported over an inch of rainfall for last 24-hours. Five sites had amounts over two inches. This event has unfolded as a weak, 500 mb trough in the westerlies has interacted with the low-level moisture plume from Simon that covered most of Arizona yesterday morning. The remnant low-level circulation of Simon got hung up around the Baja spur yesterday, while the middle-level pieces sheared off to the northeast. The NAM 500 mb analysis at 00 UTC last evening (above) indicates two vorticity maxima within the broad trough over the Southwest. The one over northeast Arizona may once have been directly associated with Simon. The stronger maximum near Yuma has been moving across Arizona during the night, with bands of showers ahead of it - thus, the two distinct periods of heavy rains over the metro area and local mountains. Shown below is 00 UTC NAM analysis for 250 mb, with upper-level trough still back over central California. The various model forecasts from 00 and 06 UTC forecast the early morning showers here reasonably well - as opposed to the first go-around at mid-day yesterday. The main part of the short-wave will be moving on out of Arizona by evening, but the possibility of at least isolated showers will remain until this trough is well past us. Thunderstorms developed yesterday afternoon as PW increased from the south and CAPE developed. The plot of 24-h CG flashes through 12 UTC this morning above shows that storms stayed mostly over higher elevations to the south of Tucson. More showers moved across southeastern Arizona after midnight, producing at least light rains at almost all observing sites. Across the ALERT network 86 of 92 stations measured rainfall - amounts were generally 1/10 to around a 1/4 of an inch. Three sites had over 1/2 an inch and Keystone Peak measured 1.14 inches. The Sasabe RAWS site had 1.27 inches. Amounts were generally heavier over the southwestern sector of the network - see below plot of 24-h amounts ending at 5:00 am MST this morning. here at the house there was 0.12" in the gauge. In addition to increasing moisture and CAPE, a fairly distinct 500 mb circulation developed during the afternoon over western Arizona - 00 UTC 500 mb plot below from NCAR RAP. The 00 UTC 500 mb NAM analysis indicated that this circulation and vorticity max was separate from that to the south with Simon. This circulation brought in cooler midlevel air, helping to spark the early development of storms. The rainfall was not predicted by most of the models in the 00 UTC runs nor in the midnight runs - the HRRR model did pick up on the storms in southeast Arizona, but I don't know if this was a response to radar indications or an actual forecast prior to any activity. At this time it is not yet clear whether Simon's remnant circulation at low-levels has crossed Baja. 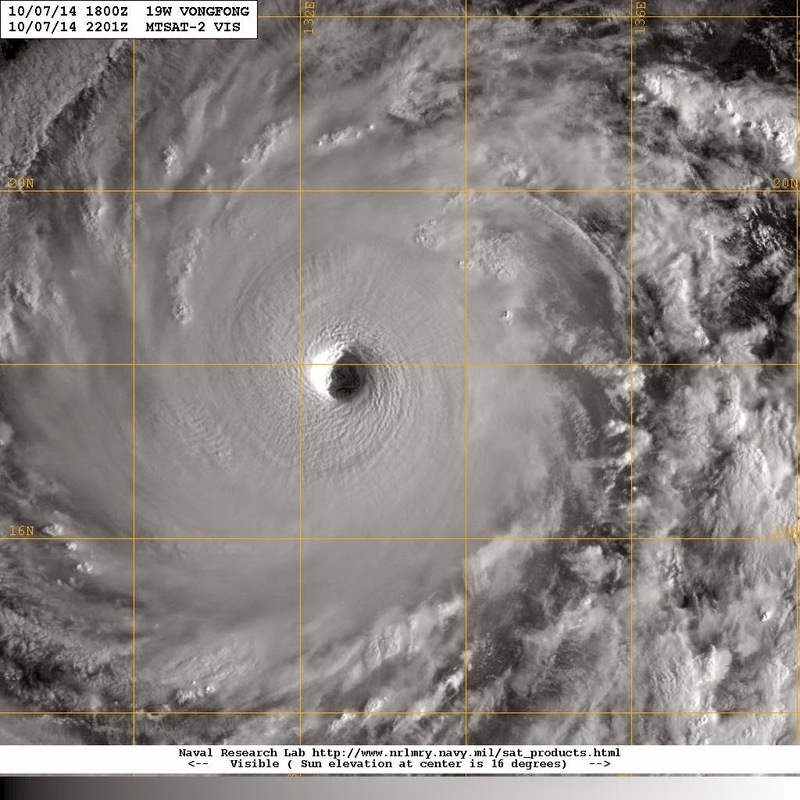 Jack Diebolt sent the above 2201 UTC visible image of Super Typhoon Vongfong, which is far out in the western Pacific. 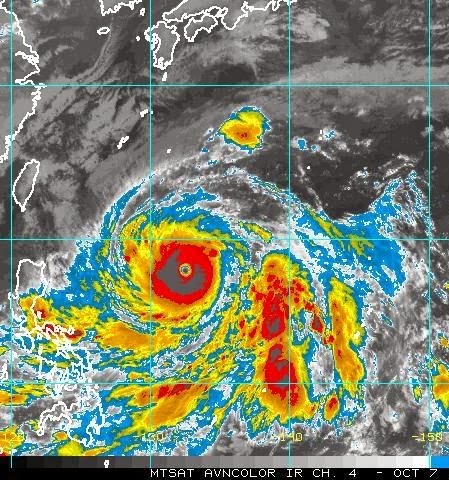 The IR image below is from 2132 UTC and shows that Vongfong is about directly south of southern Japan. At bottom is current forecast for the super typhoon from the Joint Typhoon Warning Center. Current wind speed estimates for the storm are sustained winds of 155 kt (178 mph) with gusts to 190 kt (219 mph). This morning Simon is still being called a tropical storm, although the deeper cloudiness has mainly left the low-level circulation behind. The visible image above from 1430 UTC shows Simon located almost due west of the Baja Spur, with thick cloudiness extending from Baja and northwestern Sonora into southern California, Arizona, and the Great Basin. An IR image from the same time shows that currently deep and very cold cloud tops are very limited in extent and over Baja. The NHC currently forecasts the remnants of Simon to decay near the Arizona border southeast of Yuma. The main role of Simon in the developing weather event over the Southwest will be the low-level moisture that feeds well north of Simon's remnants. The WRF model forecasts from early this morning remain very similar to those from yesterday. The forecast above is from the early WRF-NAM and is for 850 mb winds and dewpoint temperature - valid time is 6:00 am MST on Thursday morning the 9th. Very high dewpoint temperatures, for this time of year, extend northward all the way to southern Nevada as the weak, 500 mb trough from the Pacific consolidates over the lower Colorado River Basin. Significant CAPE and thunderstorm activity activity develops ahead of the trough, initially far to the west of the Tucson area. Also of interest, is that the forecast above indicates that Simon's remnant circulation is stuck on the mountains north of the Baja Spur and that a new low develops ahead of the trough, north of Yuma. The 500 mb trough is forecast to move across Arizona very slowly and significant CAPE doesn't develop over eastern Pima County until Thursday in the WRF forecasts. The slow movement of the trough in the westerlies will mean that the potential is significant for locally heavy rains, particularly where southerly, moist winds interact with the terrain and/or where training echoes develop. The forecast below is from the early WRF-NAM and is of total rainfall amounts through 11 pm MST on Thursday night. The WRF-GFS version seems way too wet, to me, as it was in the Odile situation - the GFS version forecasts rain amounts of over 10 inches out at the far western edge of Pima County. Regardless, it appears that the overall event will continue to evolve slowly through the rest of the week. 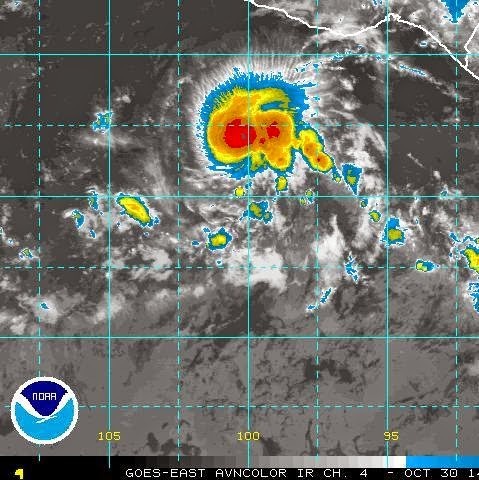 Tropical storm Simon is now located southwest of the Baja spur with max winds estimated at 40 kt. Simon is weakening rapidly and becoming a remnant low, as it's middle-level circulation detaches and moves northward away from the low-level circulation. The visible image above, from 1430 UTC, shows that deep convection is no longer directly with the surface low, but is displaced from north through east of Simon. 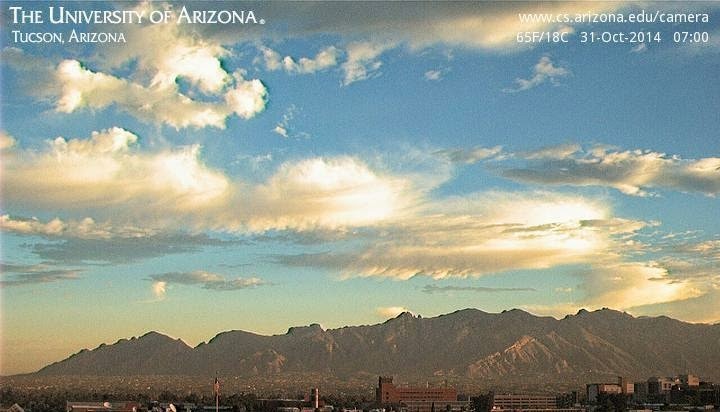 High-level cirrus from Simon now covers most of southern Arizona and some of southern California. Low-level moisture from Simon has been feeding thunderstorms over western Mexico and Baja - plot of CG flashes detected through 0700 UTC is shown below. No thunderstorms yet this side of border, as PW remains very low - dewpoints have moved into the 60s out around Yuma, but morning sounding indicates moist layer is very shallow currently. The sounding from Empalme this morning (second below) indicates 46 mm of PW and substantial CAPE and also CIN, so storms most likely on the mountains in Sonora. There is no organized wind field below 400 mb at Empalme this morning, so no strong advective fields are acting on the mT air as of this time over the GoC. It appears that the middle-level vorticity associated with Simon will be picked up by the developing 500 mb trough west of southern California and move northward across western and northern Arizona, as the winds around the trough increase in speed. The NHC currently predicts the remnant depression from Simon to move into southern Arizona in a couple of days - track is quite similar to that forecasted for Odile last month. The WPC (once called the the Heavy Precipitation Center) predicts rainfall amounts through Wednesday as per graphic above - the WPC forecast indicates the heavy rains moving along the NHC predicted track for the remnants of Simon. The rainfall forecasts from the early run of the WRF model at Atmo are quite different from the WPC forecast - graphics above and below show WRF rainfall predicted through 11 pm Wednesday night. Neither model forecasts much rainfall until cooler air arrives at middle-levels with the the California trough and thunderstorm activity develops. The GFS version (above) forecasts one swath of heavy rain stretching up the Colorado River Basin and extending into the western Rim Country, with a second swath across the northern GoC and into parts of Pima and Santa Cruz Counties. The NAM version of the model (below) keeps the heaviest rainfall out in western Arizona. Both versions of the WRF forecast a weak surface low to move northward across western Arizona during the day on Wednesday. I took a careful look at the model forecasts on the 5.4 km grid and the low in Arizona seems to develop as the 500 mb trough approaches, with the Simon remnant low remaining to south and west (through 11 pm Wednesday). So right now it appears that anyone who wants more rain from this situation can find a model forecast that will make them happy - but which of the forecasts will be closest to what occurs in the real world? What Will Become Of Simon?